The TV has a good panel to make the most of your 4K content (including that available at 60hz), it has 3 HDMI 2.0 ports, enough USB and audio out option and above all, isn’t available through flash sales! You can go online and pick it up. However, keep in mind that the TV doesn’t not support HDR 10 which other TV’s like the Mi TV 4 support. The UI is ok, and the TV isn’t the slimmest there is. You will have to keep the view of the IR receiver on the TV clean if you want the remote to work fluidly. All-in-all it is a good budget 4K TV considering that better alternatives aren’t easily available in stock. Also, considering the 34k price point of the TV and the features on offer, it is a good deal. When you purchase a TV on a budget, chances are you are making a compromise in one department or the other, be it picture quality, panel quality, OS, thickness, audio quality, etc. For a price of Rs 40,000 we have seen the launch of a bunch of TVs in the market offering not only 4K but HDR capabilities as well along with a slim form factor. Today we have with us the Kodak 50UHDXSMART TV. The TV boasts of a 4K resolution (3840×2160) but it is not HDR enabled. The TV is priced at Rs 33,999. Is it a worthy investment? The Kodak 55UHDXSMART TV isn’t slim like the Mi TV. To be clear, I’m ok if a budget TV isn’t slim. 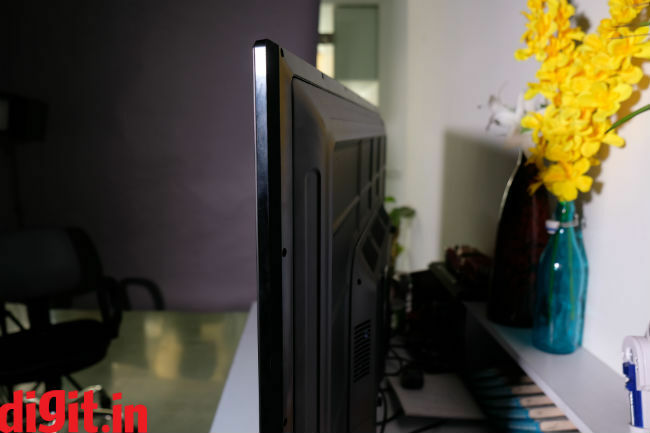 When you are on a tight budget, compromise on slimness is OK. You can wall mount the TV or put it on a tablet. I used the included table stand to set up the TV. The table stand is made of metal, sturdy and holds the TV in place very well. The table stand is high enough to house the PS4 Pro or Xbox One X under it without interfering with the panel of the TV. You can easily house a 2.5-inch high sound bar under the TV. If you plan to placing something taller than 3-inches, then you may want to consider their placement in a cabinet beneath the TV. Small devices like the Apple TV should fit snug under it. 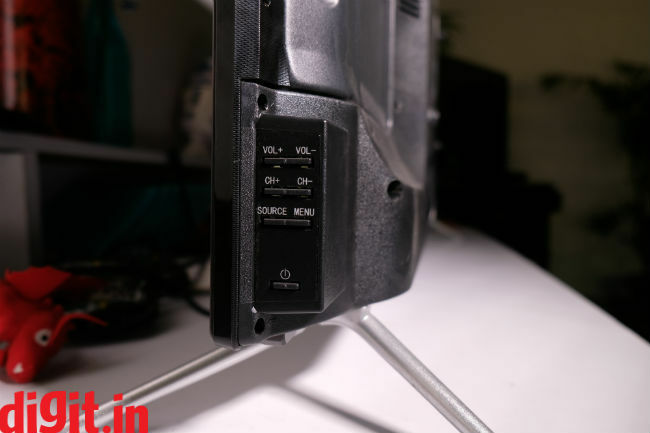 When it comes to connectivity, the Kodak 50UHDXSMART TV has 3 HDMI ports, two USB ports, an Ethernet port, an SD card port, one Component In (RGB Cable), one Component/Y Pb (Cb ) Pr (Cr ) and good old antenna connection as well. The TV has a coaxial port for audio along with the good old headphones jack. 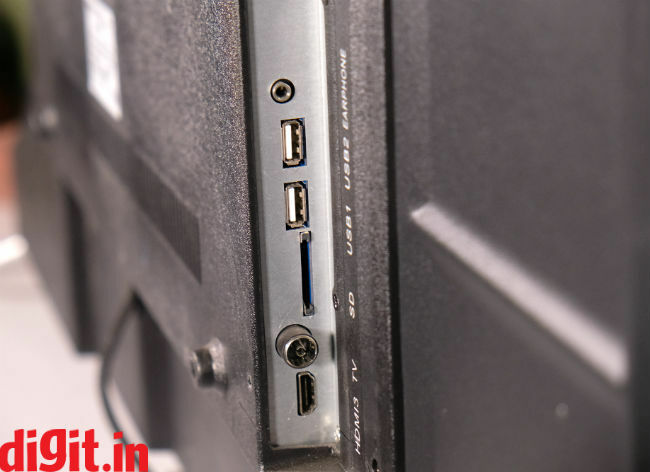 Overall, three HDMI ports are a good number to connect your gadgets. It has abundant audio output options as well which is nice. The rear HDMI ports are quite close, so if you have a Fire TV stick or a first-generation Chromecast, you won’t be able to plug them in without an extender for convince. 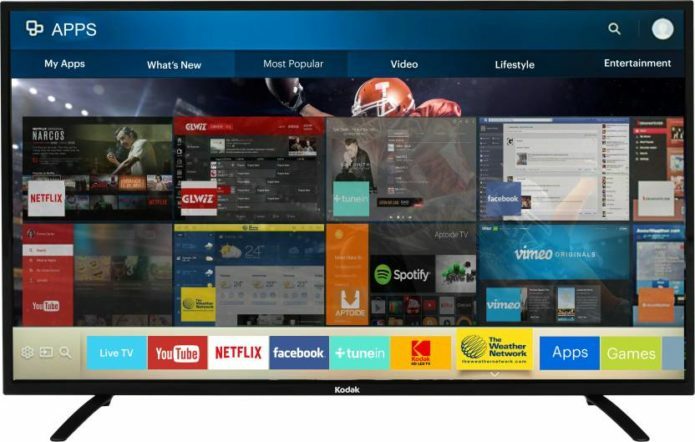 The Kodak 50UHDXSMART TV boasts of a 10-bit panel that’s made by Samsung. It has 4K resolution, which is 3840x2160p. If you’d like to know the advantages of a 10-bit panel, I’d like to redirect you to our Mi TV 4 review where we’ve highlighted the advantages of a 10-bit panel. 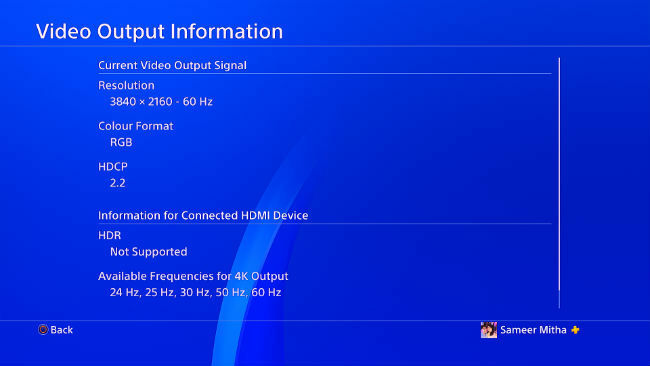 As you can see from the image below, the TV doesn’t support HDR. 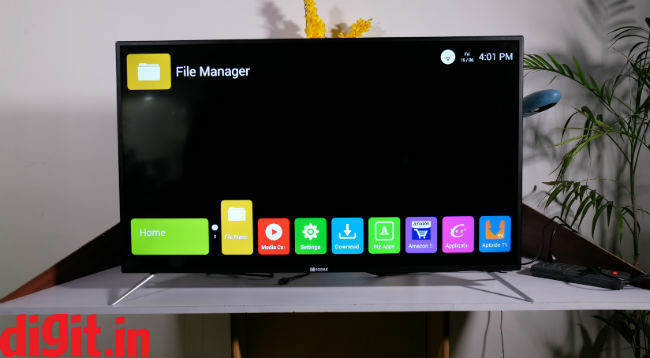 The Kodak 50UHDXSMART TV has a bunch of built in services like Netflix, Hotstar and more. It has hot keys on the remote too. Pressing the hot keys launches the app in a heartbeat. 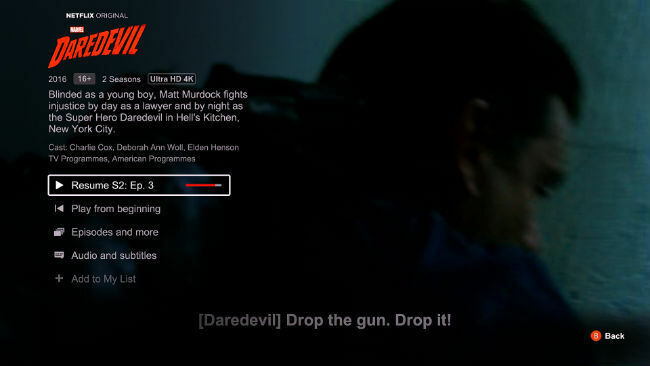 However, Netflix on the Kodak TV is the mobile app. So, you can forget about getting 4K resolution on it. Also, you can’t update the native app. This is a real bummer. You also can’t use the playback controls of the remote to control Netfilx and this can get frustrating. Don’t expect to get the best picture quality from the built in Netflix app. To make the most of the TVs panel, you will have to resort to other alternatives. Remember, the Chroemcast and Fire TV stick available in India support a maximum resolution of 1080p. To make the most of 4K you will have to invest in a 4K device like the Xbox One X, PS4 Pro, Apple TV 4K, Chromecast Ultra, etc. We watched an episode of Young Sheldon using the Fire TV stick along with the ‘Red Circle fight sequence’ from John Wick which has a lot of dark sequences with generous amounts of blue and red thrown into the scene. It streamed well, the visual fidelity was good, but in the John Wick scenes the skin tone blends a little too much into the colour pallet of the scene. Nothing that will hamper the viewing experience, but it’s still something worth mentioning. Young Sheldon on the other hand is bright with vibrant colours in the day and night sequences, it all looked really good on the TV. I recommend changing from the movie pre-set to the standard pre-set. It showed better fidelity overall and increases the brightness when compared to the movie preset. We saw 4K content on Netflix using the Xbox One X. We saw a lot of DareDevil Season 2 and Star Trek Discovery. We also saw a little bit of the Grand Tour. I couldn’t help but notice the fact that there was a lot of noise in some of the dark scenes in Star Trek Discovery and DareDevil. I tried to adjust the noise from the TV settings and it looks like medium was the best way to go. The DareDevil season 2 episode 3 staircase fight sequence was good on the TV albeit the noise in the really dark areas. You should once again leave the picture settings at standard instead of Movie and make sure that the backlight is at 100% to make the most of the TV. It works well in this setting. 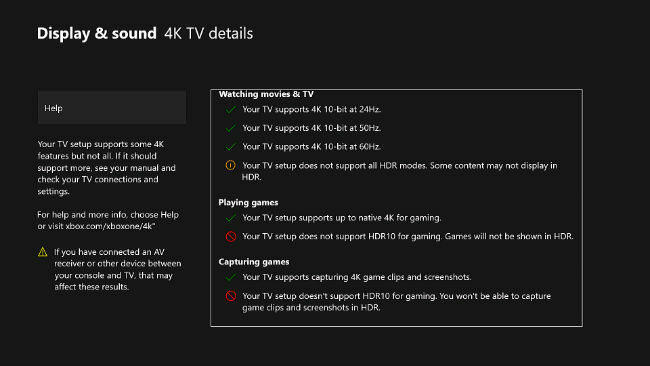 Overall, if you have access to 4K content on a device like the Xbox One X, then you can enjoy content in 4K but not HDR. The panel on the TV is reflective but nothing that’s too bad. The viewing angles are generous, but from extreme angles you will notice a colour shift. Overall, considering the price, the content viewing experience is good on the TV. We played a lot of games using the Xbox One X and the PS4 Pro. The input lag is nothing to complain about. On the One X we played Forza Horizon 3, Rise of the Tomb Raider (in 4K and in high frame rate mode) and on the PS4 Pro we played some God of War, Hellblade: Senua’s Sacrifice and Battlefield 1. The gaming experience is fun as far as visuals are concerned with the only downside being the noise in some of the dark sections of Rise of the Tomb Raider. Since we have played the same games on the Mi TV 4 we can tell you that the gaming experience is better there thanks primarily to the HDR. Thanks to HDR on the Mi TV, the visuals in games looks richer. However, since this TV will give you a 4K experience, you can make the most of the resolution bump available in games if you have one of the console. If gaming is not a priority, or if you don’t have a 4K gaming machine, then this difference shouldn’t bother you. Playing 1080p games (Rise of the Tomb Raider in high frame rate mode) worked well. The Kodak 50UHDXSMART TV has two down firing 10W speakers. To put things into perspective, the speakers sound better than what we’ve seen on the Mi TV 4, but they aren’t ideal for a movie watching experience. They are ok for everyday use such as watching news or some programing on TV, but won’t do justice for gaming or movies. I recommend investing in a pair of speakers or a sound bar. Having said that, the speakers are loud, enough for the average size living room. Watching soap operas or news shouldn’t be a problem on the speakers of this TV. If there is one problem I have with the TV, it’s with the placement of the IR receiver on the TV. It’s in the bottom right corner and you have to point the remote there precisely for it to establish a connection. 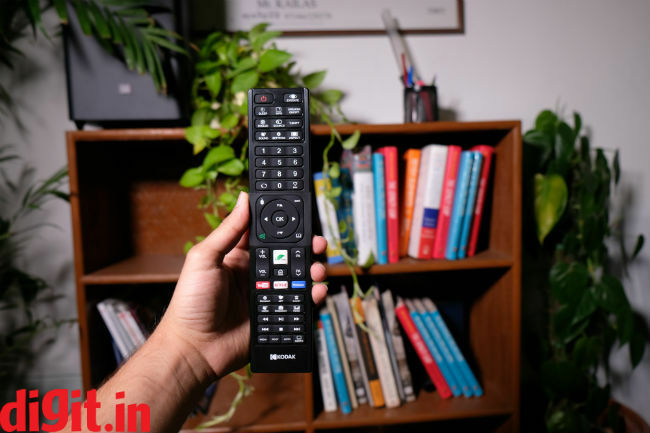 The remote itself has hotkeys for YouTube, Netflix and Hotstar. There were occasions when the TV gave me an error when I pressed one of the hotkeys, but these were far and few. The remote control itself is detailed giving you access to all settings including the ability to take a screenshot from the comfort of the remote control. The playback buttons don’t work for built in apps like Netflix but will work if your playback content is from a USB stick. Speaking of the build and design of the remote control, its plastic, and feels cheap. The buttons are rubbery and clicky. Its more because of the frustrating placement of the IR receiver that using the remote becomes painful. 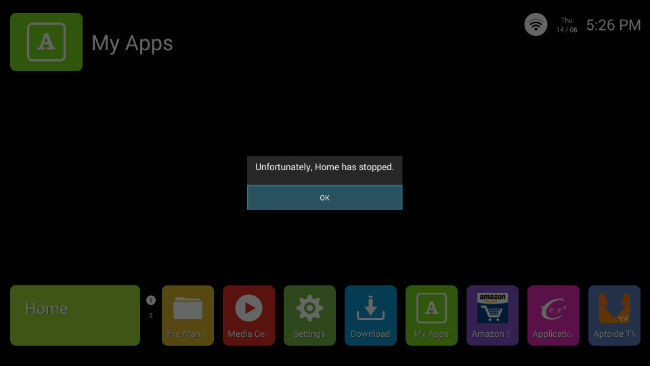 The Kodak 50UHDXSMART TV runs on Android 4.4.4, but doesn’t have Google Play store. Instead it has its own app store – Aptoide, which means that you don’t have to log in with a Google account to access the apps. 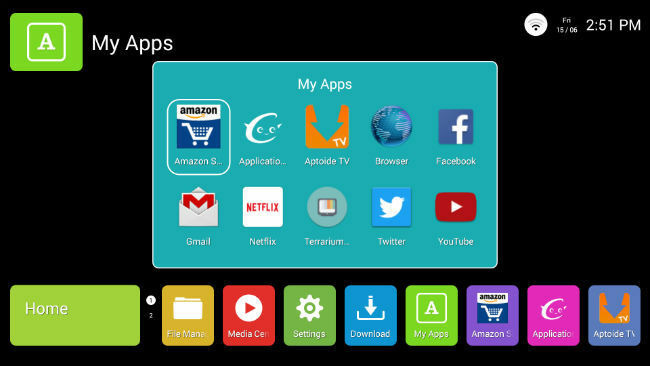 Apps like Popcorn Time, Terrarium tv and more are easily accessible for those interested and they work well on the TV. The app store has quite a bit of content for users. 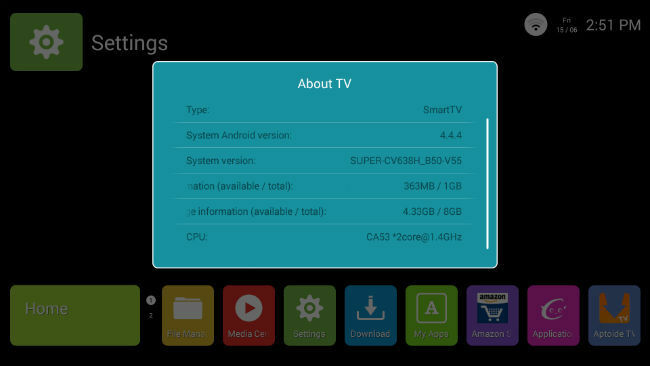 However, to make the most of the TV, I recommend a Fire TV stick or Chromecast or a gaming console or any of the dozen media streaming devices available to make your TV a Smart TV. So, here’s answering the burning question, should you spend Rs 33,999 on the Kodak 50UHDXSMART TV? Well, if it’s a 4K 60Hz panel you are looking for then why not? The TV has a good panel to make the most of your 4K content (including that available at 60hz), it has 3 HDMI 2.0 ports, enough USB and audio out option and above all, isn’t available through flash sales! You can go online and pick it up. However, keep in mind that the TV doesn’t not support HDR 10 which other TV’s like the Mi TV 4 support. The UI is ok, and the TV isn’t the slimmest there is. You will have to keep the view of the IR receiver on the TV clean if you want the remote to work fluidly. All-in-all it is a good budget 4K TV considering that better alternatives aren’t easily available in stock. Also, considering the 34k price point of the TV and the features on offer, it is a good deal.